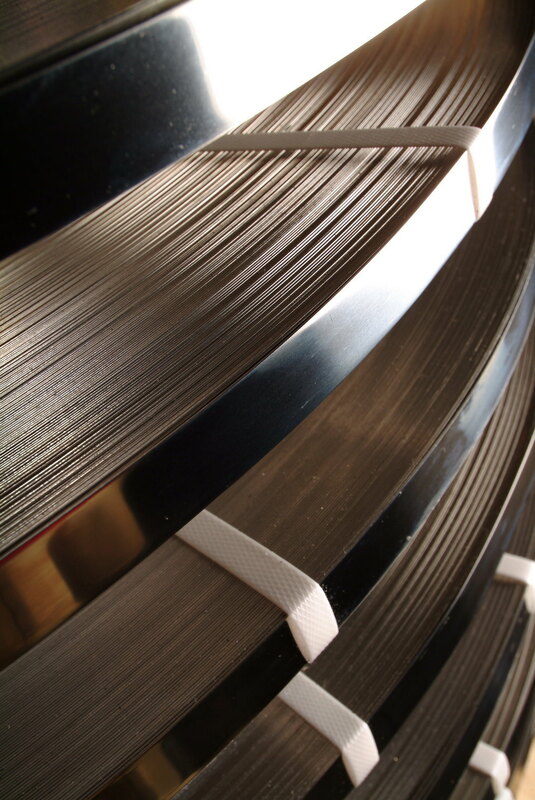 BS stainless is one of the UK’s leading independent producers of stainless steel precision strip. We offer the most comprehensive selection of grades, surface finishes, and forms of precision strip. Stainless steel strip material is used extensively in industries where, precise tolerances, and consistent quality are vital. Stainless Steel precision strip is used in applications including heat exchangers, heating elements, flexible tubing, filtration devices, cutlery products, springs, and surgical and medical instruments. We can produce to specifi­cations to suit your requirements including safe edges for handling, light weight coils for lifting, we can even supply in a range of paint finishes like our blue banding. Strip thickness from 0.010mm to 4.00 mm. Manufactured to precision tolerances and packed to customer specifi­cations. Material is produced in a range of finishes including 2B / BA (2R), 2D, HR and polished to EN / BS / ASTM standards. In addition we can also supply to order special alloys. BS Stainless supply a wide range of industries with precision slit stainless steel coil including construction, automotive, heating and ventilation, oil and gas and catering applications all within the scope of our ISO 9000 accre­dita­tion. For more information then please contact us on 0044(1)254 681112 or email info@bsstainless.co.uk.